Marcia Naomi Berger talks about marriage, relationships and communication on radio shows. At long last, Marriage Meetings for Lasting Love: 30 Minutes a Week to the Relationship You’ve Always Wanted, is about to see the light of day thanks to its awesome publisher, New World Library. You can pre- order the book at Ama-zon, Barnes & Noble, or possibly at your local independent bookstore. At long last, Marriage Meetings for Lasting Love: 30 Minutes a Week to the Relationship You’ve Always Wanted, is about to see the light of day thanks to the dedication and skill of its awesome publisher, New World Library. You can order the book or eBook here. Marriage meetings are a proven way to foster intimacy, romance, teamwork, and smoother resolution of issues. The book tells, step-by-step, how to conduct each of the four-part meeting and how to use positive communication skills that promote successful meetings. Detailed stories about how several couples benefited from holding the meetings are also included. “>You can view Marriage Meeting videoview Marriage Meeting video. You can view Marriage Meeting video. For slider #1: Marcia Naomi Berger, Therapist, with photo inserted of me in office like setting in the original form that I sent to you via email. For some reason you cropped it. If it’s easy to teach me how to put the photo on the slider, I’d like to learn. That photo is for Marcia Naomi Berger, Therapist (not Author) so please change that or tell me how. I’m sorry if I didn’t make that clear when we met in person. Regardless of what challenges a person may be experiencing, good therapy brings about a recognition of one’s humanity and inner strengths. Through the process, people find their “summer place” and achieve more fulfilling lives. Eventually I’d like to put an improved photo on slider #2 (Speaker) but we can do that after the site is live. I’m okay starting with this photo that’s there now. 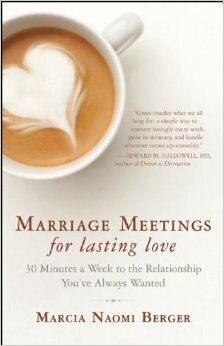 The Marriage Meeting Program: 45 Minutes a Week to Guarantee the Long Term Relationship You’ve Always Wanted, a pending book. Marriage Meeting Starter Kit, an e-book with tools and communication skills to begin conducting Marriage Meetings now. See articles here on marriage, relationships, communications, emotional/mental health, creativity, and more.